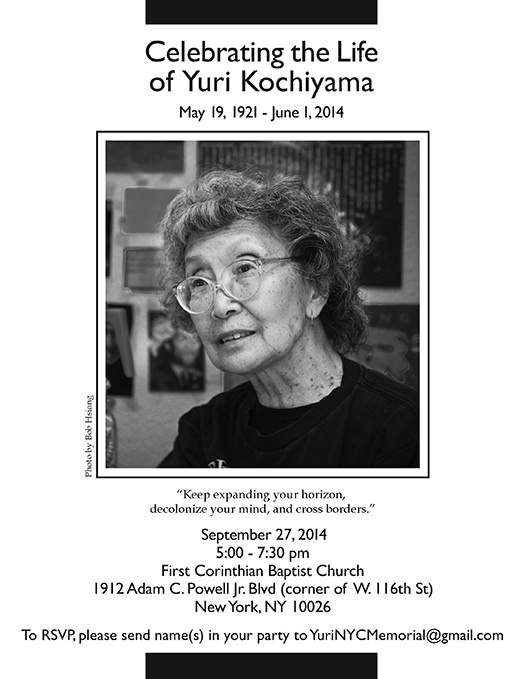 On Saturday, September 27, 2014 at 5 pm, New Yorkers will come together to celebrate the life of legendary activist Yuri Kochiyama. She was a friend, mentor, and inspiration to all of us at AALDEF. The event will take place at the First Corinthian Baptist Church, 1912 Adam C. Powell Jr. Blvd (corner of W. 116th Street). Download the flier here: https://bit.ly/1rfpsw3. Yuri’s obituary appeared in The New York Times, the Los Angeles Times, and the San Francisco Chronicle, and a multimedia tribute to her life and work, Folk Hero: Remembering Yuri Kochiyama Through Grassroots Art, was curated by the Smithsonian Asian Pacific American Center.